The Lonely Terrorist sat on a riverside bench in a suburb of New York where he had been commanded to undertake the Engagement, nursing the ancient flask containing the next step for human history, which God had given him. Dr Samuel Otherwise was near the end of a distinguished career in the sort of science journalists don’t get to tell the half of and most they write is wrong. Samuel had long since given up expecting anyone else to have any understanding of his work such of it that wasn’t classified anyway – or his wider ideas and beliefs. At best anyone would take it as a joke, but having totally alienated his university friends, he became overwhelmed by ennui early in life as to explaining the Plan of God with rational arguments; everyone’s false premises were so deeply engrained he could do nothing. He could not enable them to see things as God sees them, so insistent were they in seeing things as men do, applying human value judgements to everything, even the brightest and best could not place themselves outside the space-time continuum and perceive the mind of God. When in the old country, centuries ago, the first of his ancestors to bear the family surname was told he must take one, the official added, “There will be a monetary punishment, …otherwise”. Having a twisted taste for the vinegar of constructive sarcasm, this ancestor took up the very name “Otherwise”, while others were taking surnames from their professions, shtetls or favourite plants, just to crystallise for all posterity the fact that the family name had originated under the duress of Government threat. On emigrating to America, a later ancestor had changed the original Andernfalls to Otherwise to keep the story alive, but in English an additional flavour came out that had not been present in the original name; “Otherwise” suggested that the wisdom of the bearer of the name was something other than the wisdom of this world, and this facet seemed indeed to run in this family. They had always kept a family book they called the Andernfalls Apocrypha, which father had passed onto son saying that the original bearer of the surname had written it. The treasured family heirloom and greatest secret, which had been begun centuries before in Hebrew, Yiddish and some unknown language but was retranslated on arriving in America in English, with the earlier languages on alternate pages. The physical book was an ancient-looking ledger originally designed for tax accounting, but instead what was contained in its columns was esoteric philosophy and poetry, metaphysical and recondite of understanding, but fathers had instructed eldest sons, generation after generation in its meanings, handing the text down together with the Divine interpretation. 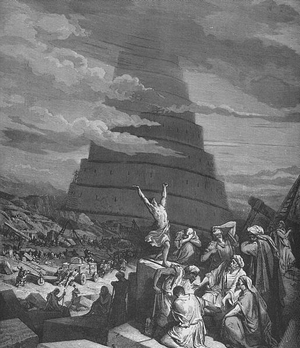 Most passages in these home-made Apocrypha were by way of revelations concerning parts of the Book of Genesis – most especially, the incident of the Tower of Babel. Though only a few verses in the Bible, the detailed account to be found in the Andernfalls Apocrypha was longer and more detailed than the Biblical account of the life of David. And the Otherwise clan had always believed their destiny was in some respect related to what they believed was revealed to them to have happened one morning, on the plain of Shinar, very nearly seven thousand years previously by their calculations. The book had had many things added to it by Samuel this time not for posterity, he being the first in the bloodline to have begotten no children. A twelve-year marriage had ended in tragedy when his wife died of an unknown form of meningitis, but previously it had been empirically established by laboratory tests that Samuel was “to blame”, as she had put it, and not infrequently, for the lack of offspring from their union. But the tome contained a prophesy that when the first Andernfall appeared without seed, it meant he was the New Peleg and would do for the end of History what the original Peleg had done, as it claimed, for the start of it. And so it was not the eccentric gentleman geneticist, Dr Samuel Otherwise, a man whose exemplary career had been responsible for modifying bacteria to produce new foods to feed mankind and new treatments to heal them, not someone twice shortlisted for the Nobel prize and scheduled to win it next year to co-incide with his planned retirement, who sat on that bench across the river from the highly securitized hotel building with a stone bottle in his now clenched fist, but … the New and Final Peleg. From the Andernfalls Apocrypha – Book Of Peleg Chapter 3 verses 1-15. (As used in evidence afterwards). 1. And the Lord appeared unto Peleg, saying “I am aggrieved with Nimrod, and his Shinar Tower. 2. His hunting expeditions killing the dragons and placing idolatrous images in caves are a stench unto Me. 3. Moreover they pry the codes of genes again and remember not why I sent the Flood aforetimes. They pretend not to know me as their forefathers, only because this generation hath not seen me with their eyes, as the forefathers did. 4. Wherefore I am determined that they never shall. 5. So the miracle I now do, I do by natural means and human agency, the which art thou, my servant Peleg, one of the remnant which hath understanding and hath not bowed the knee to Nimrod and his brutalities and idolatries. 6. Wherefore, go to, take this flask. Break and place at the main vent unto Shinar Tower. 7. For six days and nights shall they give the plague silently one unto the other. Therefore thou must needs engage tonight, on the eve of the festivities for Nimrod’s return with all his hunters. 8. After seven days, the descendents of Adam shall fall sick, and shall sleep for three days and three nights. 9. Then shall they awake, but shall no more understand the speech of Adam. Each shall have his own speech, so that the mother understandeth the daughter not, the father comprehendeth not the son, neither the wife the husband. 10. Hence they must go their ways unto the farthest corners of the earth. Each family must isolate to rebuild their tongues around that of the mother, once healed of the plague. 11. Only after years will they be able to speak fully again, but it shall be in vulgar tongues, each uniquely framed in grammar and containing only random vestiges of the tongue of Adam which I breathed into him in granting sapience. 12. And the tongues of mothers shall become tongues of families in the tens of years, the tongues of families shall become tongues of tribes in the hundreds, the tongues of tribes tongues of empires in the thousands, and when the Son hath come then shall the tongues of empires begin to dissolve into the separate tongues of nations, and all shall begin to reverse. 13. When one nation’s speech shall be used of all, then shall the adversary seek to establish his order, against whom shall thy descendent engage, the last of thy line. 14. Adam’s tongue shall be understood not, except by the Son who did speak with Adam therein in the Garden, for when thinking with it there is no choice for faith, for the tongue of Adam carrieth knowledge of Me intrinsically, making faith redundant. Posted on 26/12/2010, in Autism related, Blog only, Default or Miscellaneous, Literature, My posts on other fora/blogs, My Stories, Other, Religion and Philosophy, Telegraph Creative Writing Competition Entries and tagged Adam, Book of Genesis, English language, God, New York, New York City, Shinar, Tower of Babel. Bookmark the permalink. Leave a comment. Президенскую гонку на Украине можно по праву назвать одной из ключевых тем для российских СМИ.